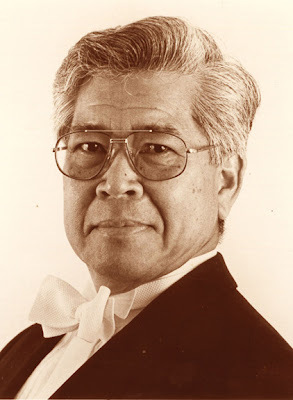 Conductor and violinist Oscar Yatco was born in Tanuan, Batangas on 23 November 1931 to a musically-inclined family. Died last 1 July 2014 in Hannover, Germany, at the age of 84 due to heart condition. He became the youngest member of the Manila Symphony Orchestra in 1944 at age 14. In 1946, at age 16, he became the youngest graduate at the UP College of Music. He trained with renowned teachers such as Ivan Galamian at the Juilliard School of Music in New York and Wilhelm Stross at the State Academy of Music in Munich, Germany. In 1956 while in Munich, he won 1st Prize in a music competition featuring all music academies in all of Germany. He was frequently a soloist of philharmonic orchestras of Berlin and Munich. He became the musical director of the Manila Symphony Orchestra for ten years. Due to his exemplary skill and recognizable unique talent, he was given lifetime tenure as a professor in the State Academy of Music in Hanover, Germany in 1979. In 1980, he was appointed conductor of the CCP Philharmonic Orchestra, which would later be renamed Philippine Philharmonic Orchestra, and was designated as the national orchestra of the Philippines, concurring with Yatco's crusade of orchestral development. He also held the position of First Concertmaster of the Wagner Festival Orchestra at Bayreuth from 1974 to 1979. On his 75th birthday, for the first time, his entire family expressly flew from Germany to watch him conduct and be honored (his German wife Brigitte, his three daughters and their respective husbands and two little grandchildren, a boy and a girl) on stage making a heartwarming scene at the concert "Ode to the Maestro, a Celebration of Life and Music" at the Philamlife auditorium last Oct. 22 2005. As explained in the printed notes, the orchestra was a "joint collaboration of musicians who have worked with the Maestro and in one way or another were inspired by his achievements and passion to his craft".